Flannel Softs is the perfect pattern for all those baby flannels out there. 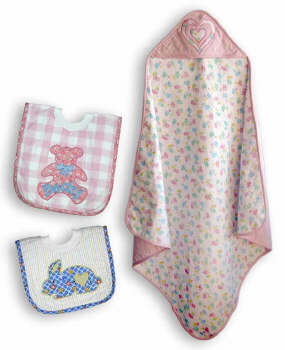 Pattern includes instructions for a hooded receiving blanket (40� square) & two sizes of bibs (11� Infant & 14� Toddler) as well as easy fusible appliqué designs & an alphabet for embellishing or personalizing the bibs & blanket. You can choose from a teddy bear or rabbit for your bibs. Designed by: Becky Stefanoff.